A myriad of patients meet with a Cosmetic Surgeon each year to learn about various ways they can enhance the appearance of their nose. A small demographic, about 10 – 15 percent of these patients are African-Americans, and the percentage is increasing steadily. Individual patient’s reasons for wanting Nose Surgery varies, since noses are unique to the patient. Some patients are not satisfied with the noses they’ve had since birth, and some gradually become dissatisfied when they notice the changes their nose exhibits as they become older. Other patients endure physical trauma that has distorted their nose, and they want to reclaim their original nose. There are also patients who simply want to breathe easily with a clear nasal passage and better air flow. In essence, the shape and size of the nose greatly affect facial harmony and function. The nose is the focal point—a tiny alteration can elevate facial harmony. 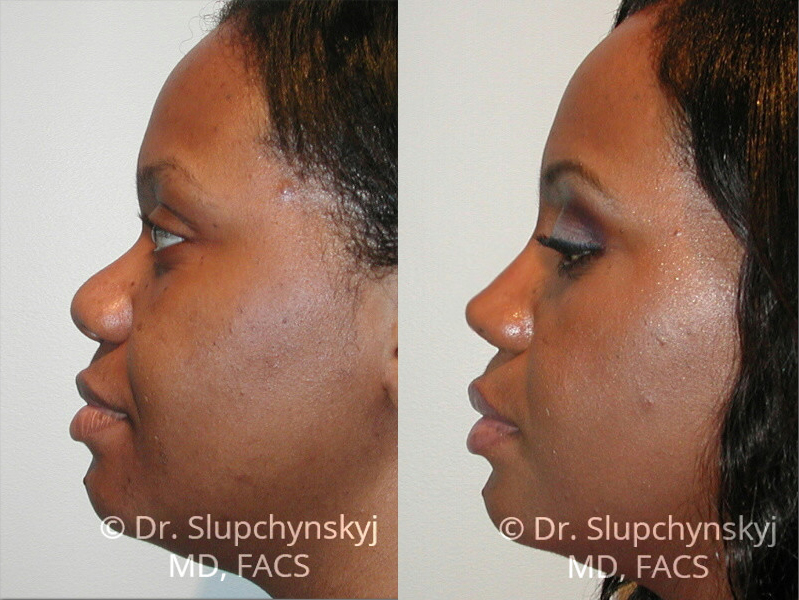 To learn more about African-American Rhinoplasty, Contact Dr. Slupchynskyj to schedule a consultation. … To make a long story short, I would enthusiastically recommend Dr. Oleh Slupchynskyj to anyone, but more specifically, if you are African-American and looking for a highly-qualified surgeon, he is your man! For me, it was important to find someone who was going to do it right the first time, because you always hear these horror stories about people needing Revision Rhinoplasty Surgeries. It was well worth the effort to pursue a surgeon who may not have been the closest in proximity but delivered the results I was hoping to achieve. Dr. S. is the best! ~ W. M.
Countless Cosmetic Surgeons try to profit from the growth of African-American Rhinoplasty by claiming that their practice treats Ethnic Rhinoplasty patients exclusively. They claim the category Ethnic Rhinoplasty is all-inclusive, which groups all non-Caucasian patients, whether they are Middle Eastern, Indian, Hispanic, Asian, or African-American into a single classification. This oversimplification has incorrectly classified Rhinoplasty into 2 groups: Caucasian and non-Caucasian (Ethnic) patients. It groups all non-Caucasians together without acknowledging numerous anatomic differences between multiracial ethnicities. It relates to cultural factors and fails to identify the individuality of each patient. This issue is also called flaring nostrils and is a predominant consideration for African-American Rhinoplasty patients. Customarily, removing the nostril skin to reduce the nostril’s flare has been the common approach to decrease wide nostrils in African-American Rhinoplasty patients. This basic method typically results in an overdone appearance, and in most cases, the nostrils develop an upside down V appearance instead of the optimum curve of a natural-looking nostril. Dr. Slupchynskyj prefers to strategically reshape the entire nostril and not simply rely on skin excisions to address flaring nostrils in African-American Rhinoplasty patients. This technique has enabled him to achieve superior results in reforming the nostril in African-American patients. Via sculpting and tapering the cartilage in the lower tip, Dr. Slupchynskyj can address a wide and bulbous nasal lobule (tip). Occasionally, he grafts cartilage to help build support, structure, and definition of the nose tip. For his African-American Rhinoplasty patients, Dr. Slupchynskyj has perfected a procedure to achieve the best results, which doesn’t merely rely on cartilage grafting. Unnecessary cartilage grafts can leave the nose with a fabricated appearance and might not be an ideal choice for patients who seek a natural nose. Commonly referred to as a Wide Low Hump, this complication is due to the bridge of the nose is too low, wide, or both. Numerous Rhinoplasty Surgeons attempt to narrow the nose by Osteotomies or to break the nose to narrow the bridge. Dr. Slupchynskyj seldom employs a standard Osteotomy in African-American Rhinoplasty because this frequently results in a fabricated appearance, causing the tip to appear bigger since the nose is too narrow. Dr. Slupchynskyj uses the SLUPimplant™ to address the nasal dorsum. He custom designs this implant for the nose of each patient. Dr. Slupchynskyj never uses laboratory manufactured implants. View more Before and After results in our photo gallery. Dr. Oleh Slupchynskyj, a recognized leader in African-American Rhinoplasty, is a Dual Board Certified Plastic Surgeon. His work is highly specialized, focusing only on the neck, head, and face. He provides 20 years of experience, as can be seen in his extensive portfolio of African-American patient before and after photos. He is the author of Rhinoplasty for African-American Patients, featured in Archives of Facial Plastic Surgery and Revision Rhinoplasty in Ethnic Patients in Facial Plastic Surgery—each an international peer-reviewed medical journal, which reference scientific data and case studies for Facial Plastic Surgery Cases. Who benefits from African-American Rhinoplasty? Patients who are disappointed with the appearance of their nose or function and are at least 15 years old. Their noses may not be in harmony with the rest of their face, and they want restore balance. Their nose might be too short, too long, or may have a crooked, drooping or undefined tip. Or, they may have a nose with disproportionate width or an extremely flat bridge. What risks are associated with African-American Rhinoplasty Surgery? Possible risks resulting from African-American Rhinoplasty include: excessive cartilage removal, improper implant removal, or the wrong implant use. While Dr. Slupchynskyj has performed thousands of African-American Rhinoplasty Surgeries performed without complications, he methodically reviews all risks with his patients during their consultation. Will there be much bleeding with African-American Rhinoplasty? And what is nasal packing? Dr. Slupchynskyj never uses nasal packing; though many Plastic Surgeons do. Nasal packing is extremely uncomfortable for any Rhinoplasty patient. Nasal packing is the use of cotton or gauze inserted into the nasal chambers to stop bleeding. Because of his specific Rhinoplasty and Septoplasty techniques, Dr. Slupchynskyj patients seldom experience bleeding during surgery or recovery; consequently, they don’t require any packing or tissue glue to abate excessive dripping or bleeding.